While all of the Academy Award nominee films are on my list to watch before February 22, I am also determined to read the books that inspired these movies. We’ve got a little over a month until the big night, and in addition to all of the reading and watching I have to still do, I also can’t wait to start planning my mini-Oscars party (even if that does only involve me, champagne, and a large bowl of nachos). Which of these books and films have you watched or read? It’s been a while since I’ve done a Read then Watch, but there are some good books and movies that have come out recently. Two of these recently released films are Gone Girl and The Fault in Our Stars. Because there’s a lot of hype around the films, I wanted to point out how great the books are. Then, of course, there’s The Great Gatsby. Of all the Gatsby films that exist, I would qualify the 2013 movie as a recent release (2013) since the first one came out in 1926 as a silent film. What are you reading then watching? 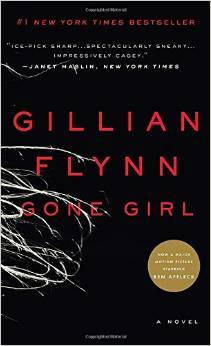 Read/Watch Tie: Gone Girl by Gillian Flynn is a read/watch tie because they were both highly enjoyable. I went to the theater with high expectations because I found the book highly engrossing, but I left very satisfied with the way things played out. I can’t say too much without revealing major plot points and spoilers, so I’ll just say that I liked both the book and the movie. Since the story is so gripping in both the book and film, you will be on the edge of your seat either way. 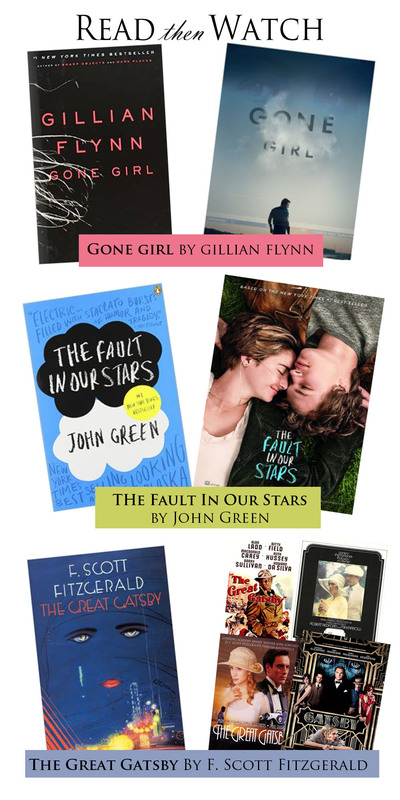 Read: The Fault in Our Stars by John Green, then watch the movie. Whatever you do, you’ll cry, so you might as well read John Green’s words between tissues since they are perfect and spot on. The way Green crafted his sentences made a world of difference. 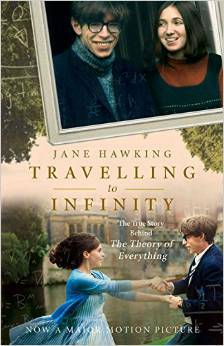 The story, the quotes, the emotions…the book takes you into a world that the movie couldn’t quite capture. That said, I did still have an emotional response to the movie, and it was well done. Read: The Great Gatsby by F. Scott Fitzgerald, then watch one or all of the movies. It’s no surprise that this classic book has inspired many other art forms to retell the story, but in this case, I’m specifically talking about the films. Because so many different versions have been made, it’s interesting watching all of the movies once you have read the book. Seeing the 1974 film compared to the 2013 film is quite a contrast, but at the core of them all, the Gatsby story remains. I highly recommend reading and enjoying the book first. I recently read a book that completely shifted my perspective about the Navy SEALs. The book is called Damn Few: Making the Modern SEAL Warrior by Rorke Denver. Denver is a former director of basic and advanced SEAL training, and this book is about his own experience as a SEAL going through training and conducting missions. The book also includes his stories on the battlefield. I was blown away every single page. I had to put the book down and just imagine the scenarios Denver explains. 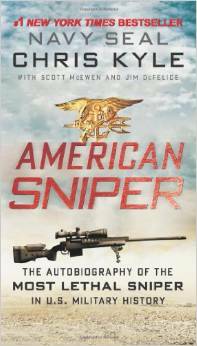 These men are heroes and warriors, but this book truly cements that. From training to real life circumstances, what the SEALs go through from the very beginning is intense, unbelievable, and just plain hard to imagine. While I didn’t know a whole lot to begin with, this book provided me with insight and knowledge that I never really expected to know. A few days later, I was excited to see how Denver’s descriptions came to life in the movie, Act of Valor, in which he starred. Not only did he star in the film, but other real life Navy SEALs played the main characters. They aren’t actors pretending to be these real life warriors. They are, in fact, the real life warriors. For that reason alone I recommend watching the movie. While the plot line can’t reveal too much insider secrets or include every single detail about the way the SEALs carry out missions play-by-play, but as Denver notes in his book, the scenes are truer to how they would conduct missions in real life. The SEALs would tell the director and producers if the scene was set-up in an unrealistic way, and they would re-work the scene to make it realistic. Many people took issue to the fact that these SEALs were poor actors, blah blah blah, but I think that’s what makes this movie unique. They shouldn’t be good actors. They should be amazing at what they do as SEALs. Even though the movie came first, I recommend reading Damn Few before watching Act of Valor. At both you will be amazed, laugh, cry, and walk away with a new-found appreciation for what these SEALs do. The book gives a fascinating behind-the-scenes look at what it takes to become a SEAL which will give you a different perspective when watching the movie, and the movie captures the fast-paced action of being a SEAL. The words from the book all come to life in front of your eyes on the screen. And it’s pretty damn cool. Read: The Help by Kathryn Stockett, then watch the movie. I read The Help when the movie was already released, and I was so tempted to just skip the book and head to the theater. But since I owned the book and knew it would take me a lot longer to get through the book if I already knew what happened, I read the book first. I’m so glad I did. This historical novel is so well-written and the characters are strong and lovable. 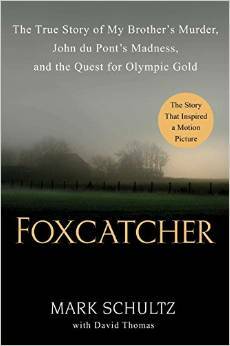 Having read the book, I almost enjoyed the movie more because it enriched the words that I had read in Stockett’s novel. 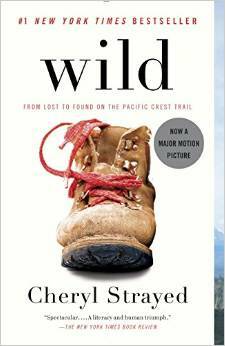 I looked forward to seeing the scenes from the book, and the story is so inspiring and uplifting that I really didn’t mind reading and watching back-to-back. 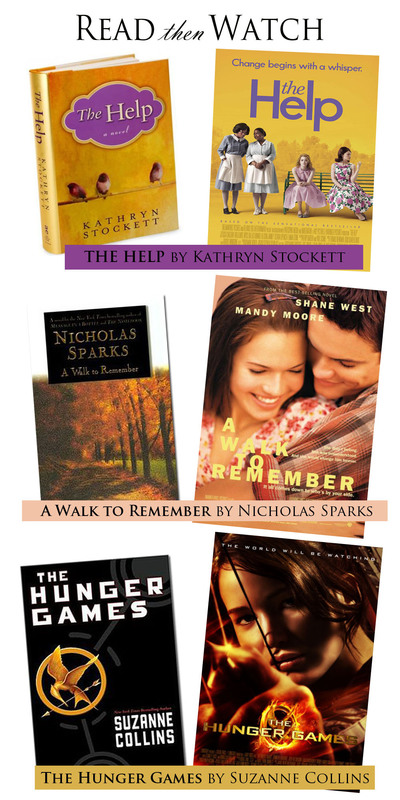 Read: A Walk to Remember by Nicholas Sparks, then watch the movie. A Walk to Remember was the first Nicholas Sparks book that I read, and I had no idea what to expect (now I can count on any Nicholas Sparks book to make me weep). About two teenagers who fall in love, I think the book and movie both captured the sweet elements of the story. While the core of the story remains similar, the book and the movie have a few character and storyline differences, and the movie is clearly more dramatic. A Walk to Remember will make your heart ache, and while I absolutely loved the movie and enjoyed seeing the characters come to life, the book made me savor the plot a little more. Read: The Hunger Games by Suzanne Collins, then watch the movie. I read The Hunger Games in one day. When I should have been working on my loads of school work, I sat in the library and pushed through until the end. I couldn’t help it, it was too addicting. I needed to find out what happened. When you want to de-stress or just have a fun read, this is a great book for those very reasons. Because I enjoyed the book so much, I admit I was a bit disappointed with the movie. The book captured so many angles of the characters and the Hunger Games, and even though the movie was over 2 hours long, it didn’t cover some great aspects of the book. However, I am a Jennifer Lawrence fan, so I enjoyed watching the movie. Plus, whether you are reading the book or watching the movie, this story is pretty thrilling and really gets your adrenaline going. I am waiting to read Catching Fire until late October so I can read it in one day and see the movie shortly after. What have you read then watched lately? I love to read just as much as I love watching movies. The thrill of imagining the characters as you want them to look, establishing the setting in your mind, and letting the story run wild in your daydreams days after you’ve finished reading are just a few of the reasons why reading is unbeatable. I love that even though people can read the same exact story, the details differ for everyone. 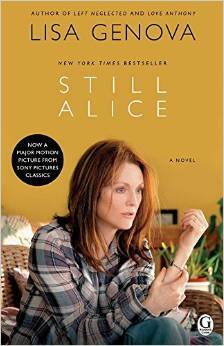 Many of the books I read, when they’re not non-fiction or biographies, have usually been adapted into a movie. When there’s a movie coming out that I know is originally a book, I try to make time to read the book first, since that way I can imagine the characters and environment before I see how someone else has dreamed it up. Through this new column, I will share the books that I think should be read before seeing the movie. 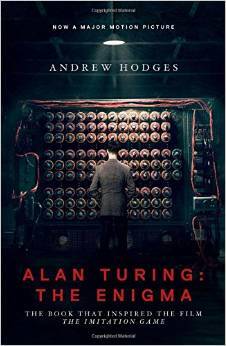 And to be fair, some books you don’t need to read before watching the movie, so I will often include those. Let’s get reading then watching! Read: Headhunters by Jo Nesbo, then watch the movie. The original title is called Hodejegerne, and is made in Norway. An American version of the film is being made because the movie was so successful. I usually don’t read or watch thrillers because the intensity can be a little too much, but I had heard great things about Jo Nesbo and decided to give one of his books a try. Despite having to take a few short breaks in-between reading, I am so glad I chose this book. It is so well-crafted and you seriously do not see what is coming. Read the book first because you’ll be better prepared for the movie – the details are so subtle and even when you know what happens, you’ll still be blown away. 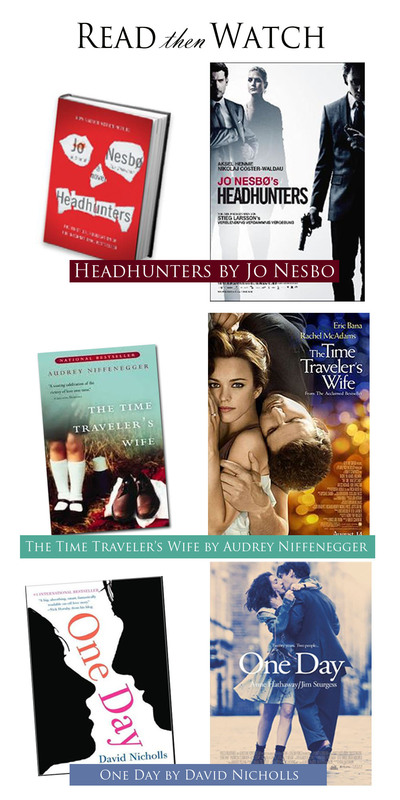 Read: The Time Traveler’s Wife by Audrey Niffenegger, then watch the movie. In my opinion, it is one of the most touching love stories. About a man who time travels involuntarily, the story has a strong impact on your heart because of how the man’s time traveling affects the love of his life. In fact, the story is so great you might be disappointed with the movie, like I was. The entire time I was reading The Time Traveler’s Wife, I envisioned Rachel McAdams as the lead, but Eric Bana just didn’t impress me. 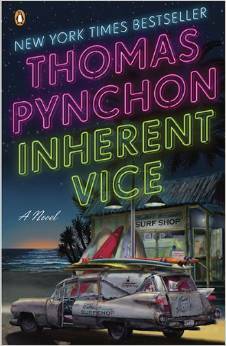 Regardless, if you do anything with this story, read it – you will definitely not be disappointed with the book. Read: One Day by David Nicholls, then watch the movie. I finished this book in 2 days – it draws you in and doesn’t let you out until the very last page. The concept of two people meeting on the night of their graduation and then meeting each year on the same day for the next twenty years was so intriguing, and the book does a much better job of capturing the details of the two friends’ lives and their meet-ups. Because the film only had 107 minutes to capture twenty years, important small moments were overlooked and the emotions were generalized. Anne Hathaway is fantastic, as usual, but I recommend reading the book first – it will stir up some pretty raw reactions. Have you read/watched any of these books/movies? What do you think: read or watch first?